Samsung Electronics, the world’s biggest smartphone maker by volume, has had a string of disappointing quarters, mostly due to declines in its mobile division. Now it looks like mobile head and co-CEO J.K Shin could be on his way out, according to a new report in the Wall Street Journal. The logical replacement, according to the report, would be fellow co-CEO B.K. Yoon, who currently heads up Samsung’s home appliances and television division. He’s the Samsung executive who has been leading various smart home projects and was the company’s most public face when Samsung purchased SmartThings earlier this year. The current Samsung Electronics management structure, in which there are three “chief executives” each running their own division, was first put in place in early 2013. At the time, the move was seen to limit conflicts of interest between the the components division, and its largest customer, Samsung’s smartphone division. There would be reason to demote mobile CEO Shin in an internal restructuring: Recent mistakes include Samsung’s mobile division reportedly over-ordering its flagship smartphone, the Galaxy S5, by a significant amount. The company has reportedly sold 40 percent fewer units than expected, and now excess merchandise is “piling up in warehouses.” In the key market of China, the Galaxy S5 sold half as well as the Galaxy S4. The Chinese smartphone makers eating into Samsung’s share in certain markets have largely adopted a strategy where they sell out of their devices before they produce them. As Samsung’s smartphone profits have slowed, the company has been unable to compete on price with inexpensive commodity Android smartphones, leading to greatly reduced margins. On the high-end, Samsung’s flagship phones aren’t competing well with Apple’s iPhone or some other high-end Android handsets. Without new compelling software features for its phones and tablets, it’s hard to imagine Samsung’s mobile divisions reaching the heights and profits it saw in 2012. An attractive alternative could be pivoting and refocusing efforts on smart home gadgets instead of smartphones and smartwatches, which would take advantage of Samsung’s existing appliances business and nascent Tizen software. But any story about [company]Samsung[/company] reorganization has to reckon with the elephant in the room: The highest ranking Samsung executive, current Chairman Kun-hee Lee, is sick, and he is expected to eventually turn over his controlling stake in the company to his three children, including Jay Lee, who is currently a Samsung Electronics vice chairman and met with Facebook CEO Mark Zuckerberg last month. 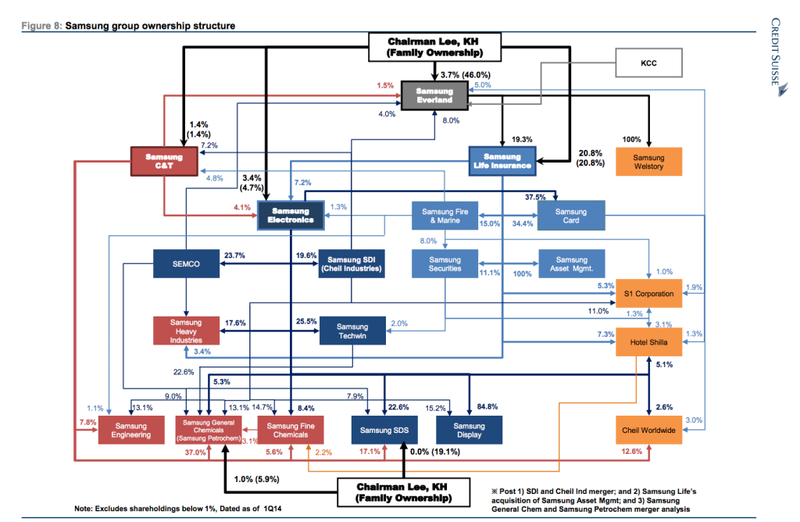 Samsung’s ownership structure is famously byzantine, partially so that the Lee family can control it despite only holding two percent of the total stock. When leadership eventually passes from Chairman Kun-Hee Lee, one distinct possibility is that the company would be broken up into multiple operations, which would trigger significant tax implications. It’s not hard to infer that high-ranking Samsung executives might be jockeying for good positioning for when the transition eventually happens. Samsung Electronics reorganization is already happening: Samsung North America president Gregory Lee is opening up new offices in California, and is consolidating the United States mobile and consumer electronics divisions. Smartphones are certainly not the only product that Samsung Electronics produces, but its mobile division is its biggest in terms of revenue. 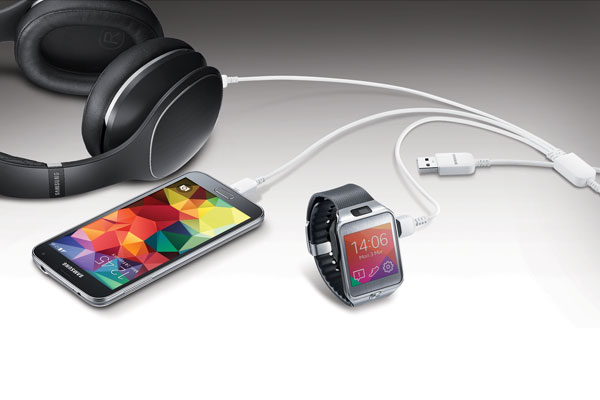 Samsung Electronics also produces durable goods like washing machines and televisions, as well as components for other devices, such as smartphone chips, lithium-ion batteries, and LCD panels. Samsung Electronics is by far the largest subsidiary of Samsung Group, which aside from its electronics divisions, has countless interests, including stakes in IT providers, shipping companies, chemical companies, and even a Korean theme park.